I had the pleasure of photographing Karen and Kinson's renewal of vows ceremony on Saturday at The Hadlow Manor Hotel, near Tonbridge. 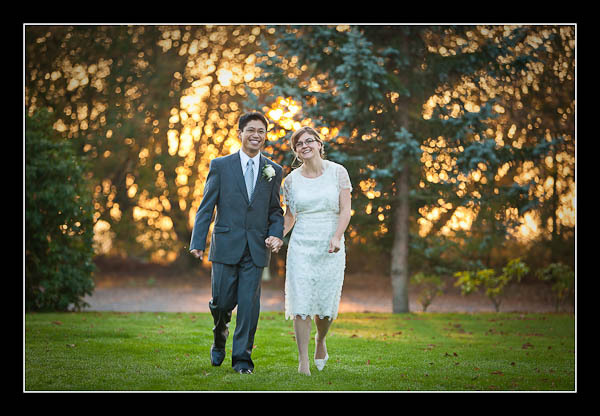 It was another beautiful autumnal day and the bride and groom portrait session was shot in front of a spectacular setting sun. Overall, a great day for photography. For more images please view the gallery for Karen and Kinson's ceremony at The Hadlow Manor Hotel or this non-Flash based alternative gallery. Hi David as an avid reader of your blog I see that the Canon EF 24-70mm f/2.8 L USM is no longer features in your kit bad on regular shoots anymore, may I ask just when might you find yourself reaching for it or has it found a new home as a rather expensive paper weight ? Also some interesting reference material for the next time someone asks you about the prospect of them entering the wedding photography business, or maybe you have already seen this youtube video ! Many thanks for your comment. I've just looked back through my Lightroom catalogues and I think the last time I used the 24-70 f/2.8L at a wedding was Nov 2008. I sold it shortly afterwards. I found that with a 16-35 f/2.8L, 35 f/1.4L and 85 f/1.2L in my bag the 24-70 f/2.8L had become redundant. I hadn't seen the YouTube video - a useful note of caution for the beginner!